Every year, the degree students are given an opportunity to teach in the SMS program. This opens their minds to a greater understanding of music and gaining teaching experience. Here’s a report from two of the degree students were part of the teaching team for SMS 2015.
them is intimidating, but we had to rise to the challenge. As Aristotle, once said, “Those who know, do. Those that understand, teach.” It was not enough for us to know our subject, but to understand and be able to teach it. As part of our SMS training we were taught how to motivate a student, analyzing his musical capabilities. We learned how to push a student to give her best and at the same time, have fun with music. We were taught how to understand and categorize students in order to develop their basic musicianship skills. The SMS has given me an overview of what it takes to not just be a good teacher but also a counselor and friend. Teaching SMS taught me to be more patient, understanding and considerate towards people. This opportunity has helped me change the way I value the important things of life, like friends, family and time. SMS has reminded me about the importance of practice, time management, preparedness and knowledge of the subject. 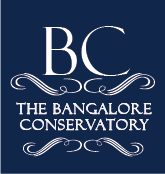 SMS was a great opportunity to teach and share the knowledge that we have gained at the Bangalore Conservatory. Still, SMS is not just about teachers teaching students, or a person gaining large amounts of musical skills and understanding; it is the relationships that we form with each other that matter most. By the end of “The most intensive and rigorous 5 weeks of music instruction” we count everyone part of the ever growing and loving BC Family. The Summer Music Seminar has given me so much good experience by showing me the areas where I need to build myself as a musician & by giving me an opportunity to build other musicians through the lessons which I have already learned. Being in charge of the choir during SMS has taught me lessons of being responsible over things like keeping time, managing practice sessions, coordinating with the band members, doing things on time and so on. SMS has also made me realize that being a music teacher or being a choir director is not easy, and requires sacrifices and hard work. I am really grateful to God, as well as college for making me part of the SMS program. It gave me real joy when I could be of help to any of the SMS students, and that’s what I want my life to be, and that is what our goals are too, “building people to build a better world through Music.” Truly, to help people, to make them understand what they don’t, and to be able to give them what they are lacking in their lives really gave contentment and joy to my heart. Summer Music Seminar 2015 has been a great learning ground for me. I have enjoyed every minute and every second teaching here. Thank You BC for such a wonderful experience, and I’ll be applying all those experiences that I have learned by being part of this SMS program 2015.